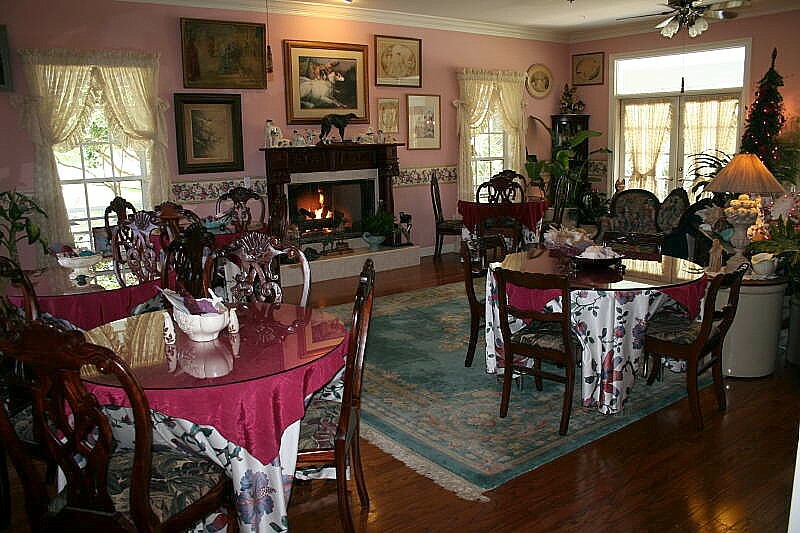 " THE Mount Dora, Florida, BED and BREAKFAST INN"
A 'STORYBOOK' Victorian Estate in Mount Dora, Florida... located on 3 Lushly Landscaped Acres overlooking Lake Dora!! FALL Weather Begins SOON !! 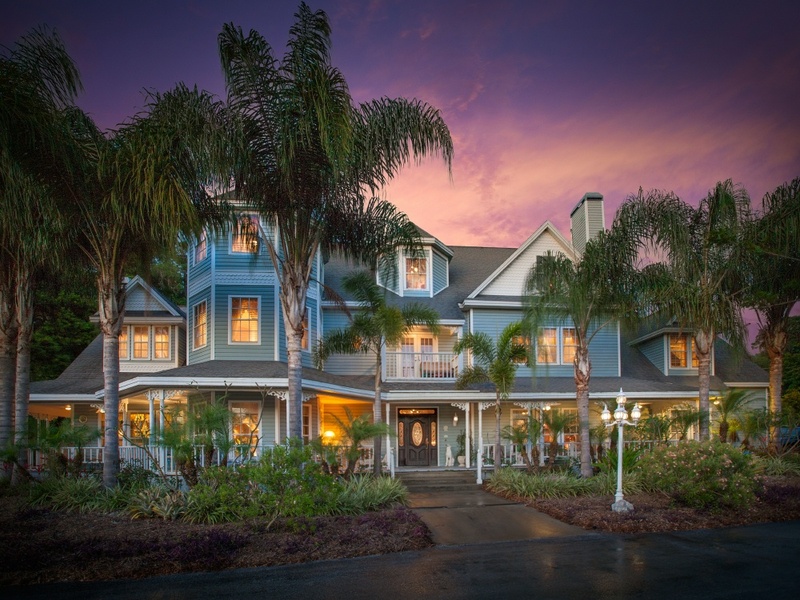 SPECIAL *WEEKNIGHTS* - Good until 10/18... 20% OFF SECOND Night !! Click on the 'Check AVAILABILITY' ICON below to VIEW Our Rooms, Rates, Availabilty and DISCOUNTS... and BOOK with US !! A 'New', 9200 Sq. 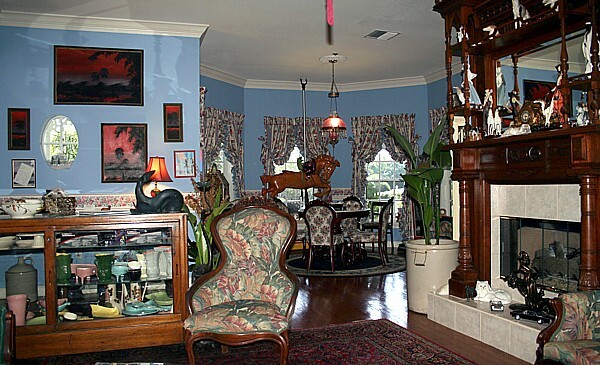 Ft., 8 Room, 1890's QUEEN ANNE Victorian Mansion. Give a 'GIFT CERTIFICATE' FOR a 'GIFT' !! CLICK on the 'ICON' below to Purchase On-Line! Margie is ALWAYS available 24 / 7 to answer questions, and take Direct Bookings!! Call 352-383-4050 for... FOUR STAR Lodging!! Below... A Special Picture of our Facade... taken by our friend, and renowned Architectural and Landscape photographer, Doug Thompson. Just 'CLICK' on the picture of our Victoria Mansion below... for 'Guided' Virtual Tour !! and for a Showcase of his Photography, visit his website - Doug Thompson Photography. Please call for Information about our Winter SPECIALS!! 352-383-4050 ! 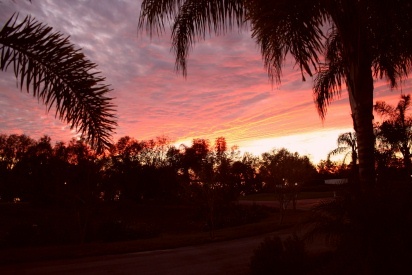 AWESOME SUNSETS over Lake DORA !! Located in Beautiful Mount Dora, Florida... and just a 4 'MINI' Block walk to DOWNTOWN!! All Rooms Include: FULL Private Bath - Flat Screen TV - WIFI - Refrigerator - Hair Dryer - Robes - MORE... and a 4+ Course Gourmet Breakfast! 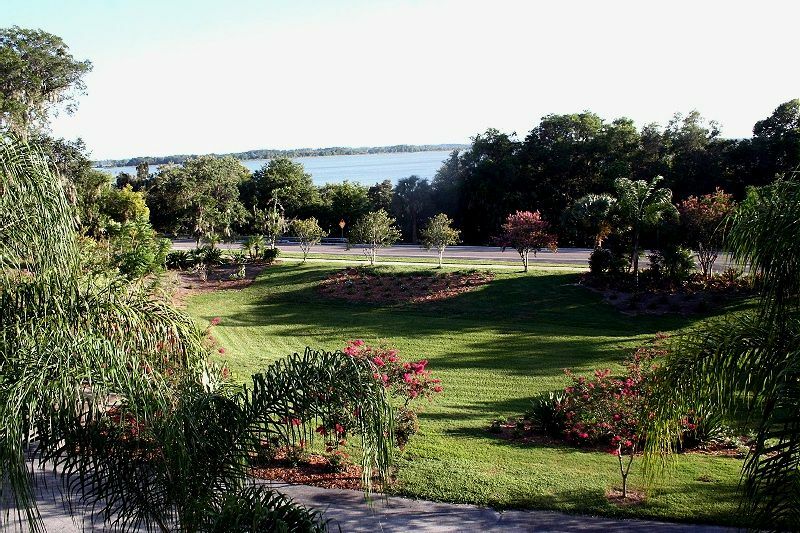 A Weekend in MOUNT DORA -- A GIRL'S GET AWAY... And/Or a GUYS' Awesome GOLF Plus GET AWAY !! FOUR ... for 19 Years. You will feel you are in... the 'Foot hills' of the Carolina's... Pennsylvania... 'Up State' New York... Vermont... New Hampshire... almost anywhere in the Northeast... and with a little Imagination... England, Austria, Germany... But the 'Palms' are a Dead Give Away! A 'BRIGHT' Spot in your Mount Dora Visit!! 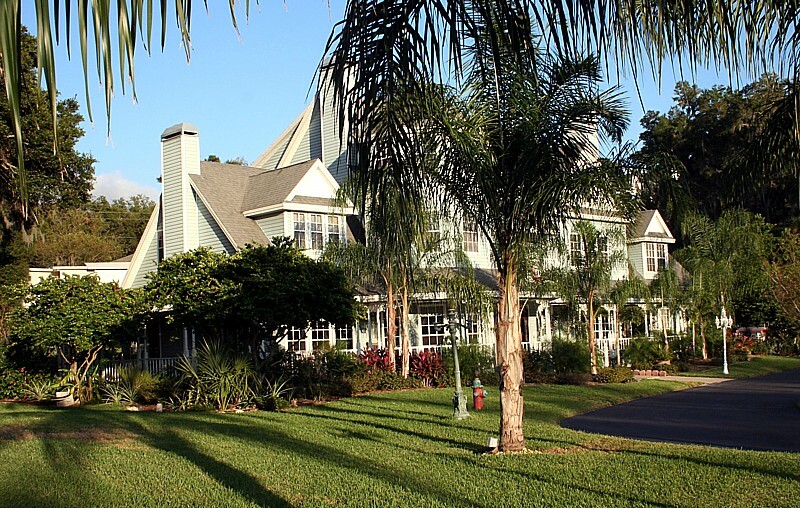 We are One of the MOST photographed 'Landmarks' in Mount Dora!! Truly an Escape to a Place lost in Time... in the Lakes and 'Foot Hills' of Florida !! During the Day... Relax around the Pool... The Plants have GROWN and the Furniture and Deck have been Painted ! 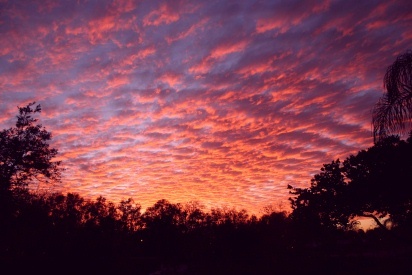 Another Beautiful Sunset... A Truly , ROMANTIC Experience!! 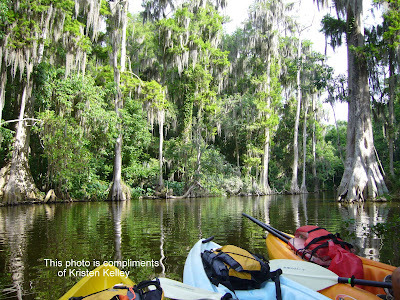 Then... GO KAYAKING through the REAL FLORIDA you saw from the SKY!!!!! Please CLICK ON the Picture BELOW to view their WEB SITE! It is a MUST See! And tell them Randy & Margie sent you!! The TRAIN is BACK and Running Wednesday through Sunday !! Due to changing Schedules... Please go / CLICK: "The Royal Palm Railroad Experience"
Book one of MOUNT DORA's Legendary Festivals, Events or Just a FUN FILLED Weekend / Weekday!! Send eMail to: innkeeper@heroncay.com. However, there are so MANY Things to be DONE here... eMail is NOT INSTANTLY Checked!! We have Eight Rooms available to our Guests: All with FULL (Tub & Shower) Private Baths, Small Refrigerator/Freezers, Televisions and WI-FI. Including 'ZOI' Garden, our first floor room which is fully ADA Compliant and also 'PET(s)' Friendly! Through his paintings and personality, James made the lives of everyone he met, a little happier and peaceful. DAMN... JAMES... How we MISS YOU!! 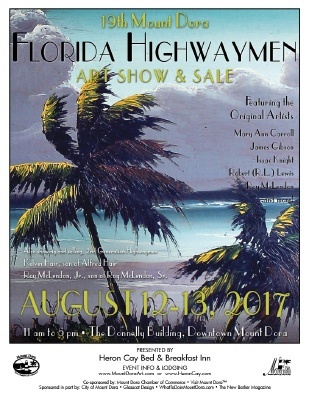 Signed Posters and Flyers from ALL 19 Mount Dora Florida Highwaymen Events... ARE still available FOR PURCHASE - Please INQUIRE. THIS is OUR HOME! YOU are a Welcomed GUEST in OUR HOME! "The rooms are large, very beautiful and clean, and a very nice bathroom. The hotel itself is very beautiful and well kept. 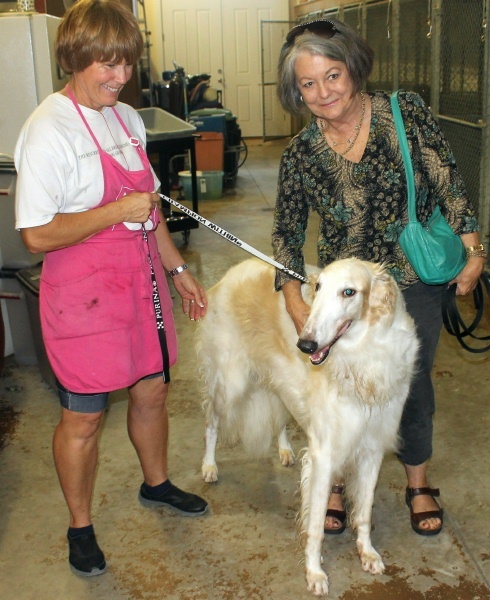 The owners are also very gracious." Sounds like she was happy... RIGHT? No WRONG! GET READY!! "However, we would not stay there again for two (Duh - Three) reasons." #1. 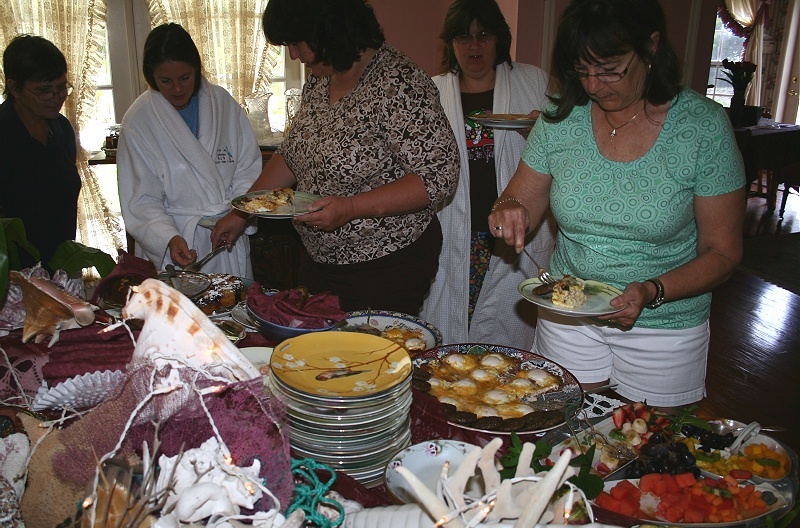 "The breakfast is a two hour event, which when it is full, we could understand, but there were just two of us for breakfast and..."
Well Okay, Margie (she called her Maggie) tells our guests that a 'Continental' breakfast is available shortly after 8:00 AM. 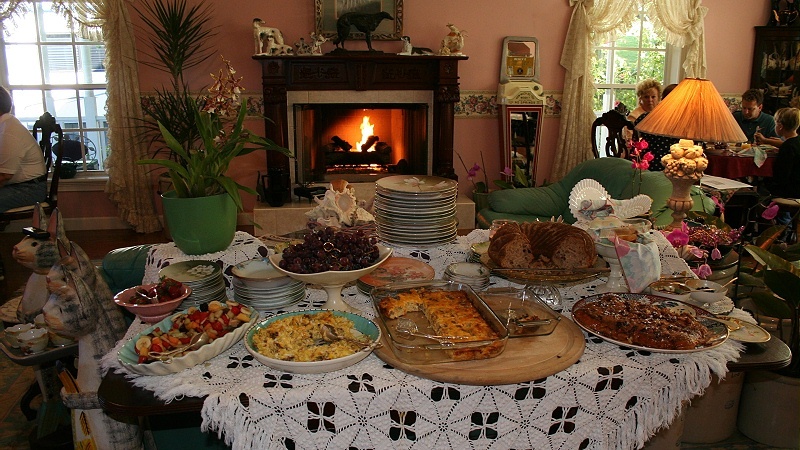 The Main 4 course HOT breakfast comes out closer to10:00 am. 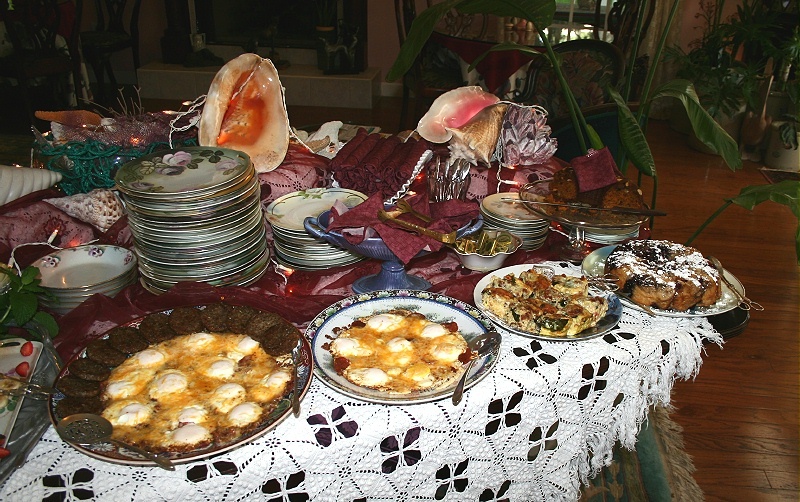 If we have only a couple of guests... instead of 12 to 18... you may have an earlier breakfast... IF YOU REQUEST !! 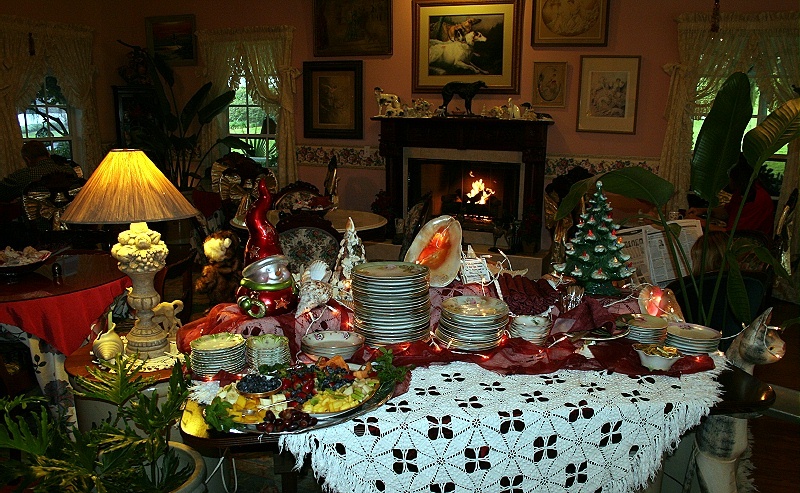 We open the Dinning room at 8:00 am... if you choose to sit there for 2 HOURS waiting for the 4+ course HOT, GOURMET breakfast to be served... SO BE IT ! AAHHH!!! #2. "There is a 'lake view' from some of the rooms, but it is not on the lake..."
OKAY... DUH!! 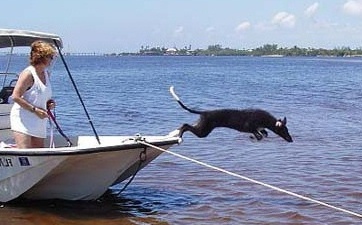 Welcome to HERON CAY LAKEVIEW Bed & BREAKFAST INN... This is in OUR NAME!! #3. 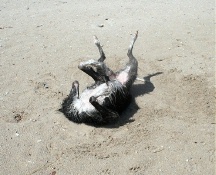 Here is the 'Number ONE' Laugh... and my 'Favorite!! "To get into town, you have to either drive or take the garden walkway path..."
NOT TRUE! We have plenty of room for a Helicopter to land or call a TAXI, hire a Limo, bring a Bicycle, and On ! I guess she expected the 'town'; to come to HER! Hey... Kathie... ALL of MOUNT DORA's B&Bs now KNOW there is No Making YOU HAPPY!! You have joined Our list of 'MOTEL 6-ers' ! Our Spacious, 650 square foot, Breakfast Area and Guest Lounge, boasting the Largest of Our SIX Natural WOOD Burning Fireplaces!! It is a 'WARM and FUZZY' Room !! 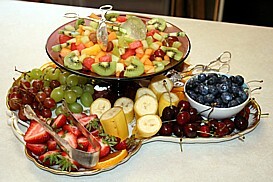 Where Our Breakfast Buffet is served 365 Days a YEAR!! 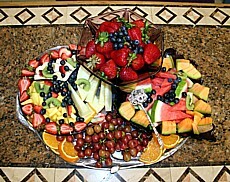 All Lodging, comes with OUR Four+ Course Gourmet' Breakfast Buffet !! 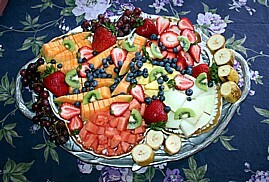 Living Up to Our 4 ... Breakfast begins with one of Randy's & Margie's 'Generous' Fruit Platters and Margie's Fresh Nut Breads!! Our Guests enjoy their meal on RS Prussia and RS Germany Porcelain from the early 1900s... and now, 2017, NOTHING Has CHANGED !! Using Randy's Mother's LADY HAMILTON Silverware from the 1940's. Margie is the BAKER!! Breakfast begins with her Freshly Baked Nut Bread and often Ends with one of her AWESOME Desserts !! The 'Reading Room' or 'Mini-Museum': Available to our Guests - 24 Hours a Day - 365 Days a Year !! A few have called this 'CLUTTER'... Please remember... this is OUR HOME... if "CLUTTER" bothers you... go somewhere else! Parking in Downtown Mount Dora may be VERY difficult to find on Weekends and during Special Events...Not to Worry!! When Life was an 'Endless' Party!! The ORIGINAL HERON CAY... 1983 - 2002 !! They are always nearby... 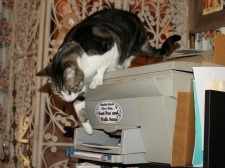 But DO NOT 'roam' the B&B... and are NEVER in the Bedrooms (other than the PET FRIENDLY Rooms) !! You will hardly know they are here... unless you would like to meet them! 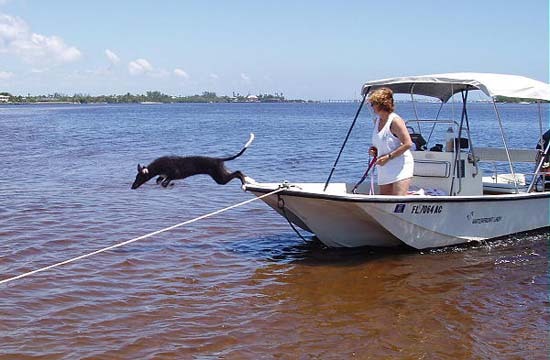 Below... 1994 - Our First Borzoi; Lady Jade at 9 months, chasing Super Star at 3 months,.. on 'The Sandbar'; their Favorite Place to Be! 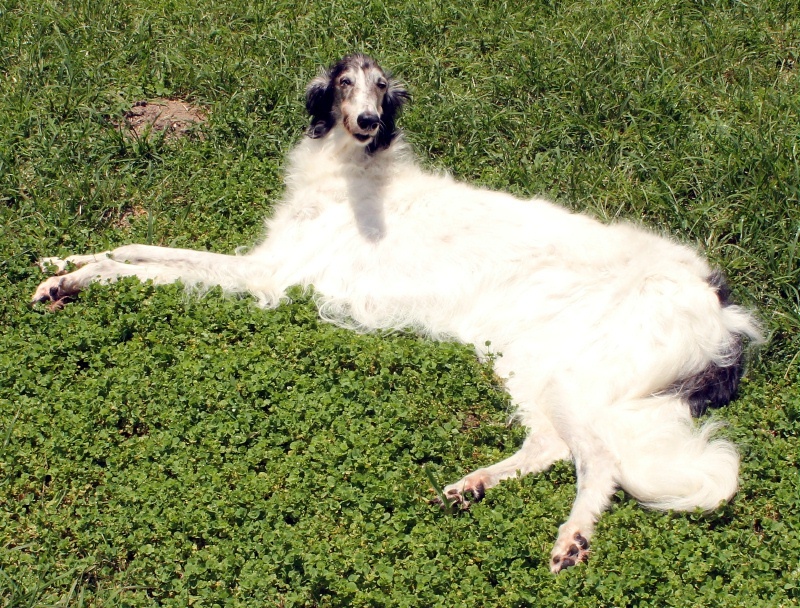 Sadly... Jade, Jasmine, Star and Kalif are Gone... CLICK 'HERE' to Visit our Current Wonderful BORZOI - 'ZOI' - (aka... Russian Wolfhounds)!! 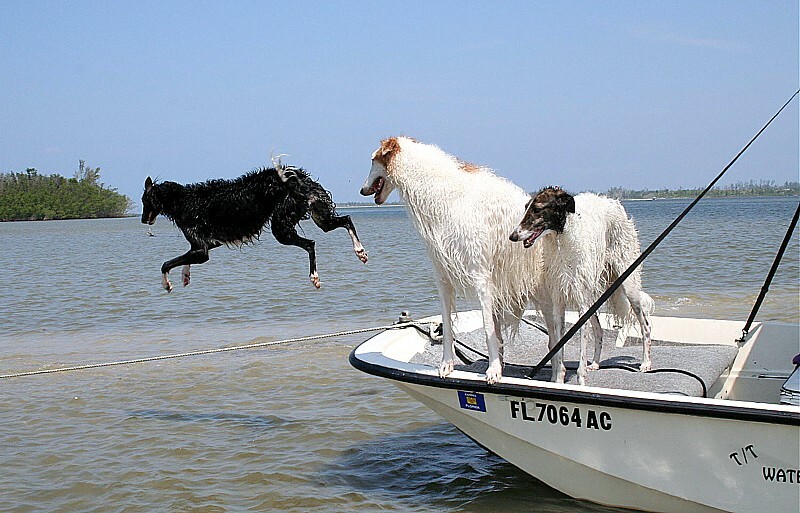 BORZOI 'Cruise' at 30+ mph !! At 'FLANK SPEED'... 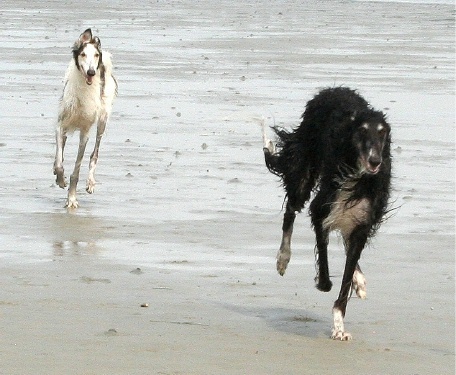 They can 'Run Down' a RABBIT... and/or 'out run' most Greyhounds !! 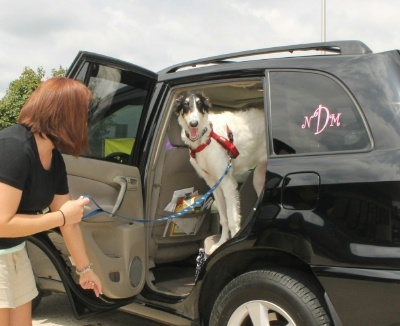 On January 23rd, 2016, at 10:30 A.M., our 'Fearless' Flying Darla suddenly died... I sat beside her, unable to do anything to save her. 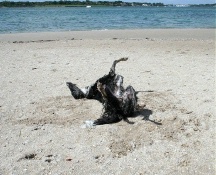 The passing of Scotty marked the END of our Original HERON CAY 'Family'. 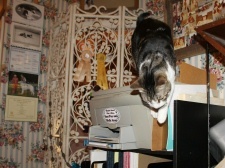 And the 'Kitties' are also gone: Jack, Foxy, Abby, Guana and now Scotty. He left his three ladies... ANASTASIA, 'Baby' DARLA... and PIXIE DUST... Now they too are All *GONE*!! 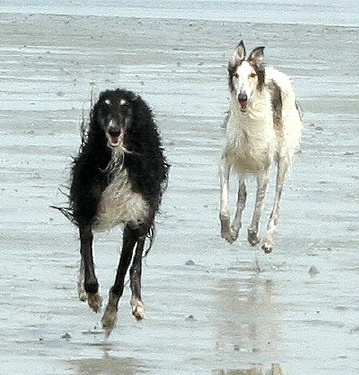 Here is DARLA and PIXIE DUST; doing what she they loved the most... Running on 'The Sandbar' ! 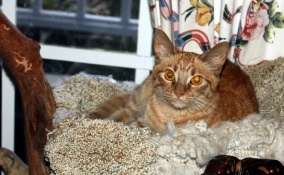 Then September 8, 2014; ANASTASIA, left us... after a two year battle with a lung tumor. Oh GOD... How she is still Missed. 3:45 pm - Monday, September 8, 2014... Anastasia died. This past Labor Day, 2016... was Four years since VONYA entered our lives. 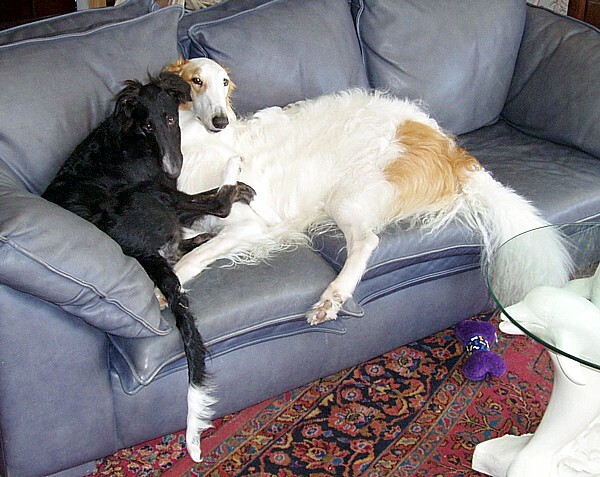 Three days after we lost my boy 'Lif'... we were asked if we could 'foster' a 6 month old Girl Borzoi puppy. We said we would... She arrived on Labor Day, 2012: When she entered our home, and lives, we knew the 'Fostering' was over. 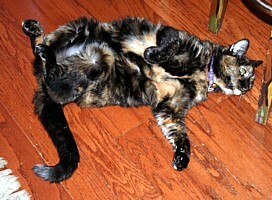 Vonya... was in her 'Forever' home, with her 3 older 'Sisters'. Between the tears... I smiled again. 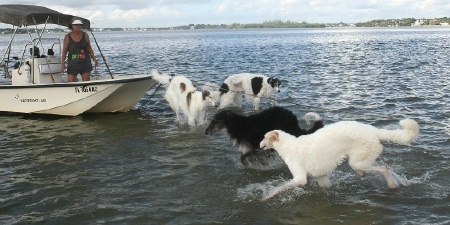 THEIR Favorite Place, and Ours, was...'On the SANDBAR!!'... 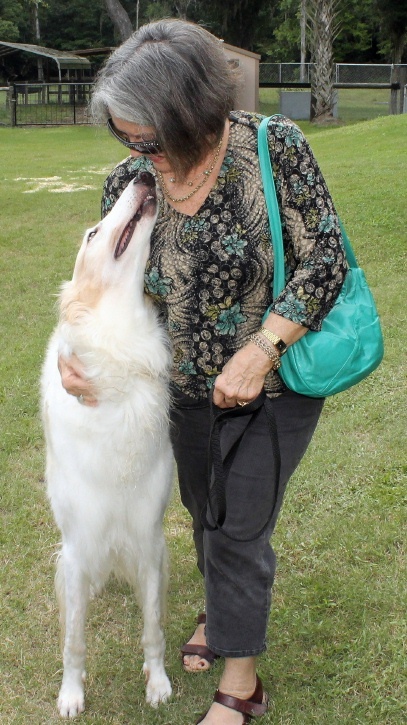 with Our Beloved BORZOI ! Darla and Pixie Dust... AT SPEED !! PRICELESS !! April 14th, 2011... not Much has Changed! 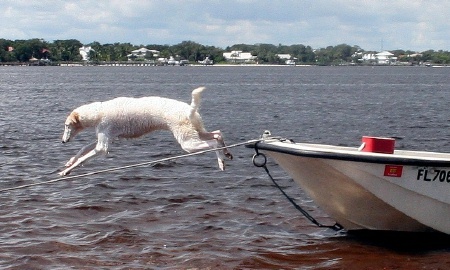 Below - Summer of 2005: One of Darla's first trips to the 'SANDBAR'... when she became know as 'Fearless' Flying Darla ! Below - June 7th, 2006... Her second summer 'On the BAR' ! 'Check' the PAWS! She is Still FLYING HIGH!! DARLA!! YES! I am BACK!! And ... doing what I love BEST... 'BREAK DANCING' !! 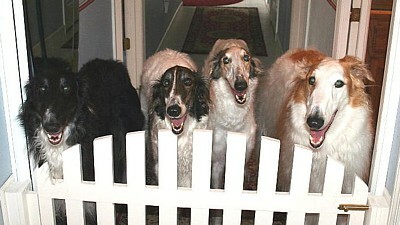 Okay... Let's GO... What's the Matter with you ALL You WIMPS ?!? "Okay... I'm Out Voted!" All On their way back home... to CRASH in the Parlor! January 23rd, 2016... Our Beloved DARLA left us... I think of her DAILY ! 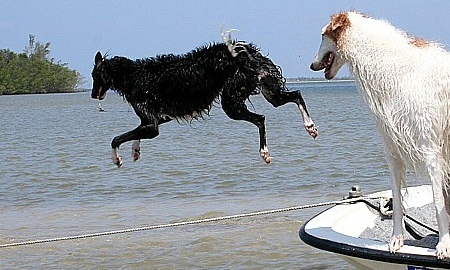 There are few things on this EARTH, that mean as Much to US, as OUR BORZOI... and KITTIES!! 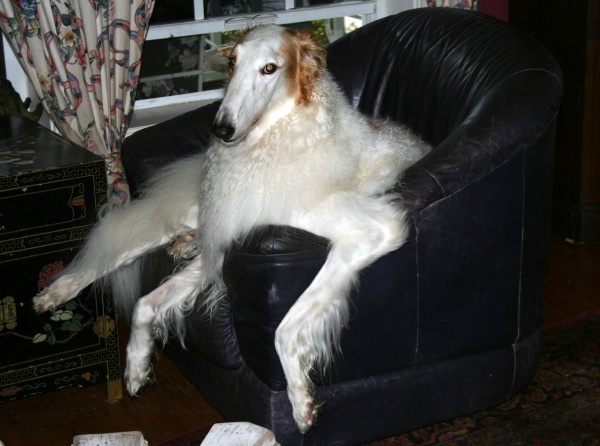 There is Nothing Like Borzoi!!!... 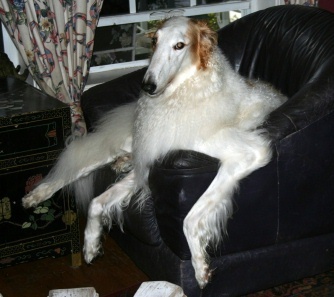 When you 'HAVE Lived With' BORZOI... you will know... 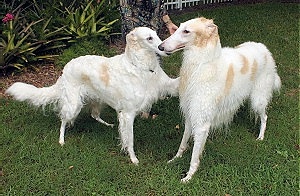 There is Nothing Like Borzoi!!! 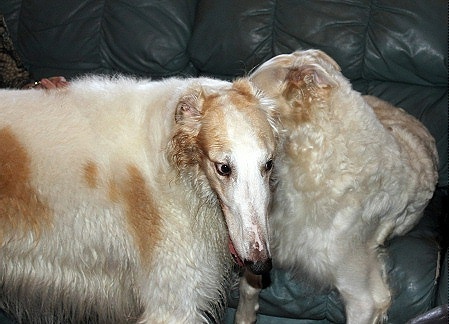 BORZOI only GIVE... and Ask BACK... LOVE!! It has been over 9 years, since we lost two of Our 'Kitties'. 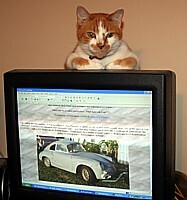 May 25, 2008, we had to said 'Goodbye' to 'Mr. Jack'; then on October 28th, 'Foxy Guy' left us... it is still like Yesterday. Abby died at home... This was hard... Very Hard. On April 12, 2016... Scotty... 19 years, 4 months Young... died in my arms... I held him in my hand when he was 5 weeks old... He was WAS My BOY !! 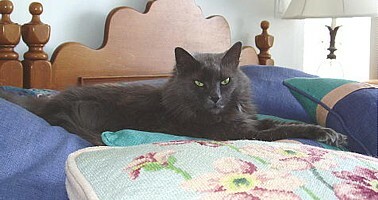 Scotty had been slowly growing weaker, we knew he would not be with us much longer. He had been blind for nearly 2 years, and I had to carry him everywhere for his last few months. When he had to 'Go', he would just 'meow', and I carried him to 'cat box'. He NEVER had an 'accident'! He was such a Good Boy! We would Never bring another 'Kitty' into his world while he was alive. It would have been so unfair to him. 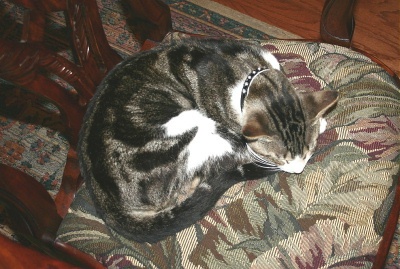 Scotty left us on a Tuesday, while I sat next to him... gently petting him... His SOUL went directly to Tommy; so many of his traits, became Tommy's... including taking his place on my pillow! Tommy, and we needed 'KITTIES'! On Friday, three days later, we were back to FOUR: Three 'Kittens' joined our Family! Scotty Approved !! 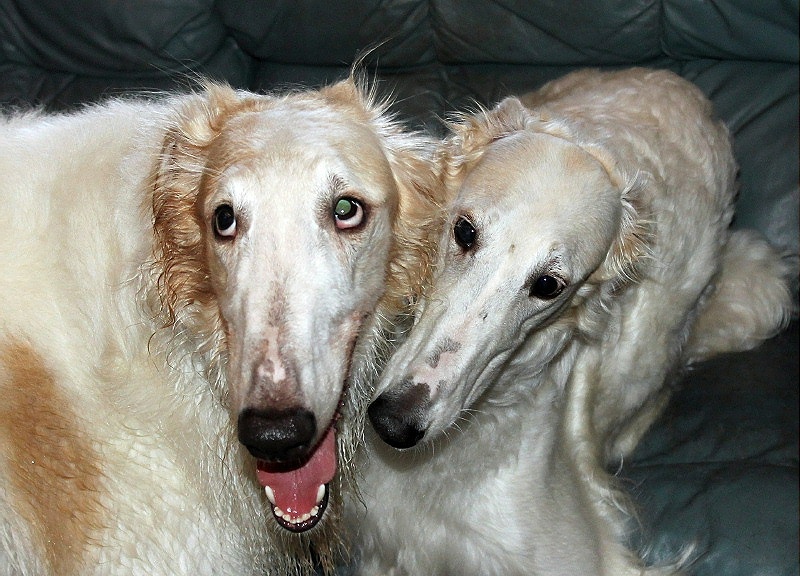 Two 8 month old Orange 'Ginger' Sisters... Jill & Jane! And an other Tabby; 10 month old ZEBE ! 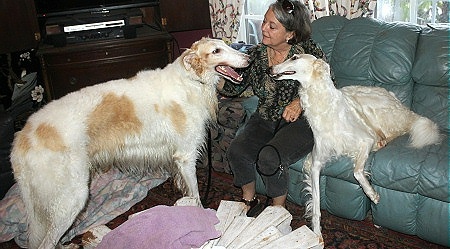 All three needed, and Now HAVE a 'Forever Home' with us and the Borzoi; they were all being 'Fostered' by Local Veterinarians !! On Thursday evening... August 17th, 2017... Tommy died suddenly, at home... 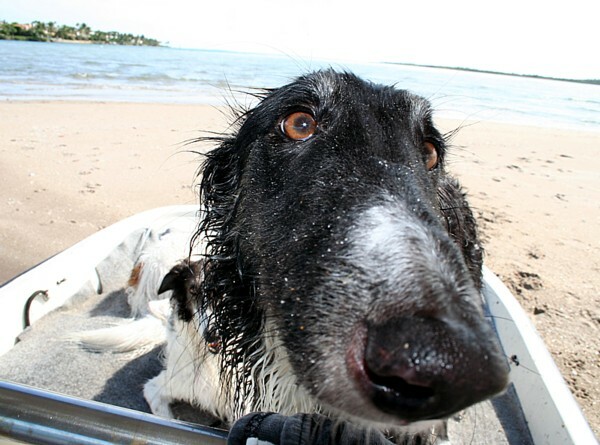 He was with Margie, his 7 'four legged' buddies and Me . He had been diagnosed with Lymphoma cancer, less than two weeks before. 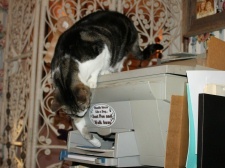 Doing one of his favorite things... Making Copies ! 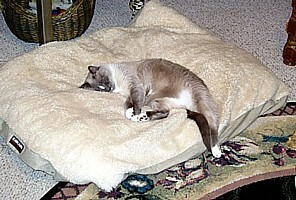 Tommy was the second sweetest (same as Scotty), most loving Kitty we have ever had... but Equal to Scotty. 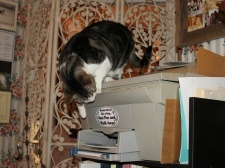 Not a mean bone in his body; I only heard him 'hiss' twice in the eight years he was with us. NO, WE Shall Never 'Let Go of', or 'Forget', Our Kids... MOM & DAD. They ALL Were, still ARE and always will BE... a Major Part of OUR Lives!! It is impossible to find 'Words'... to convey how much ALL of Our 'Kids' have meant, and still mean to us!! We Loved, and shall Always Love THEM... so MUCH !! 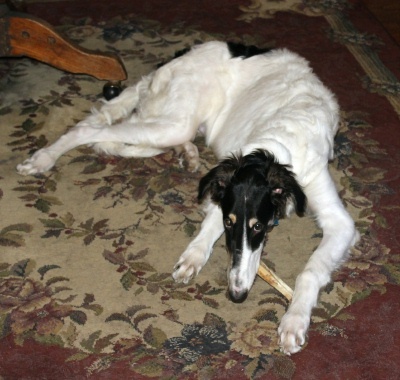 Three days after we lost my boy 'Lif'... we were asked if we could 'foster' a 6 month old Girl Borzoi puppy. We said we would... She arrived on Labor Day, 2012: When she entered our home, and lives, we knew the 'Fostering' was over. Vonya... was in her 'Forever' home, with her 3 older 'Sisters'. With 'a little help from our friends'... Especially from a long time friend, Carol Bakers (A.K.A. 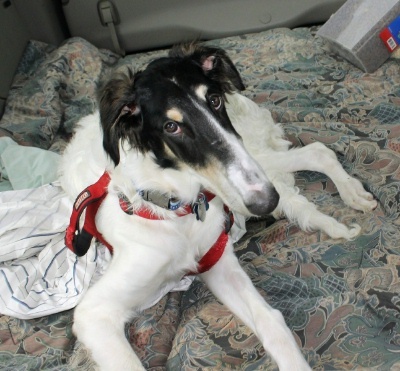 NBRF - BORZOI RESCUE), we found RINGO in Ohio! 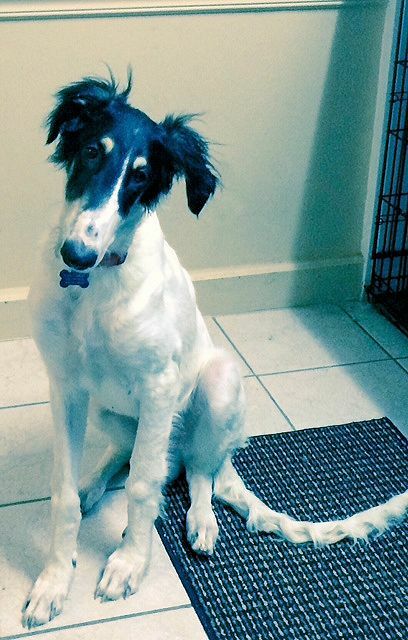 Not really a 'Rescue'... but a Puppy that could go to a GOOD Borzoi Home... We fit That BILL ! 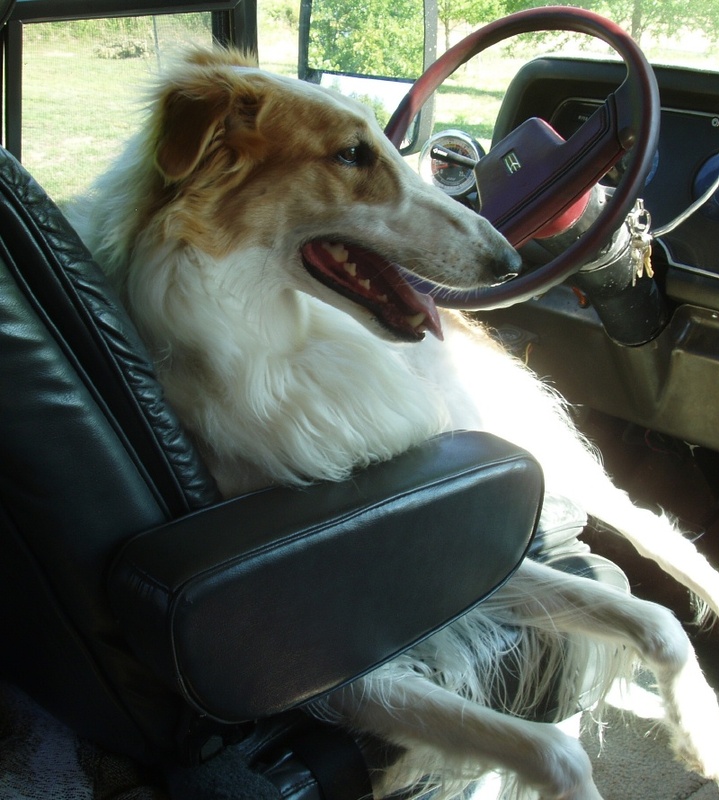 I drove to Cookeville, Tenn. to give RINGO a ride HOME!!! Continue to see MORE! BUT... Before RINGO arrived... Something VERY Special, and as we were to find out, AGAINST ALL ODDS... Happened!! 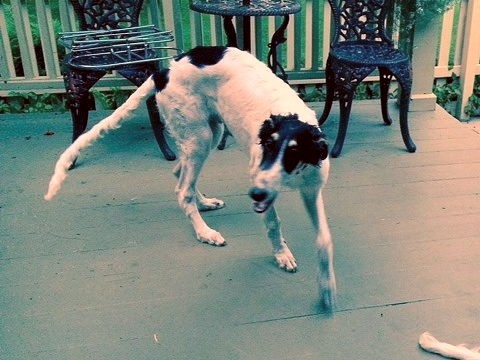 We had guests staying with us that would be 'getting' an Standard Poodle from a breeder in Micanopy, Florida. 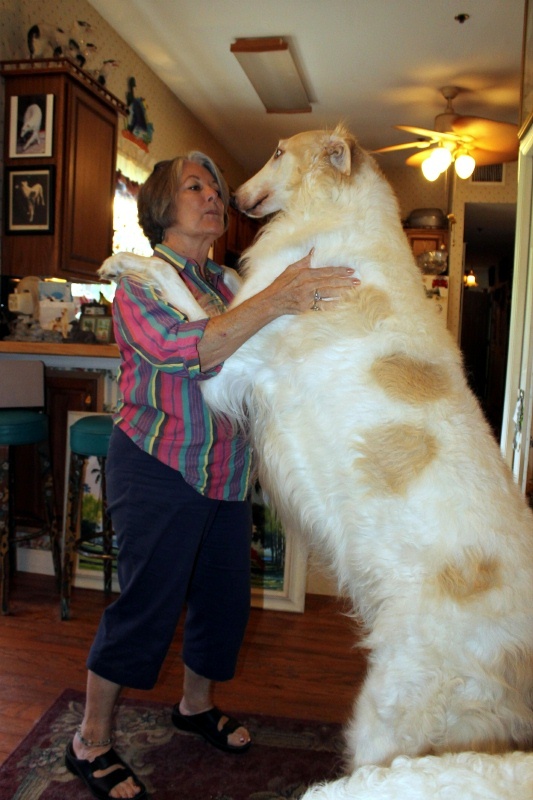 When they went to see their puppy, the breeder said, "Here's a breed you do not see often." 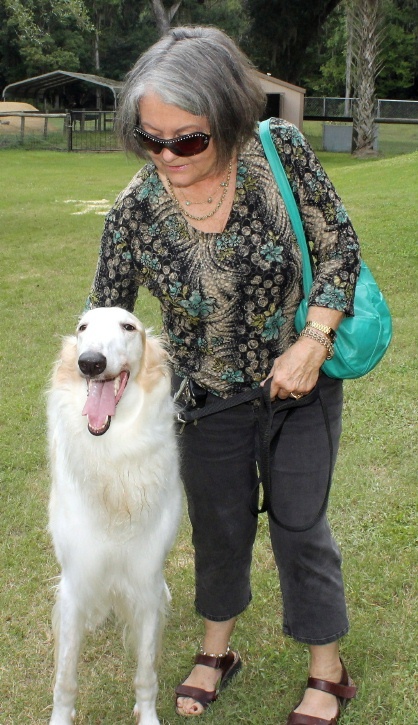 She brought out 'MAX', an AKC Champion Borzoi. They replied, "True... but the people we are staying with have three!" 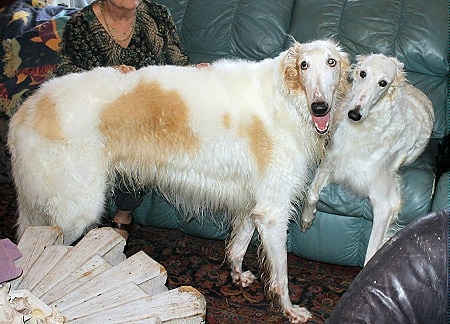 The breeder said, "Do they want another?" They knew of Anastasia's condition, and said, "Yes... I think they might!" When the guests returned; they show us pictures of MAX. 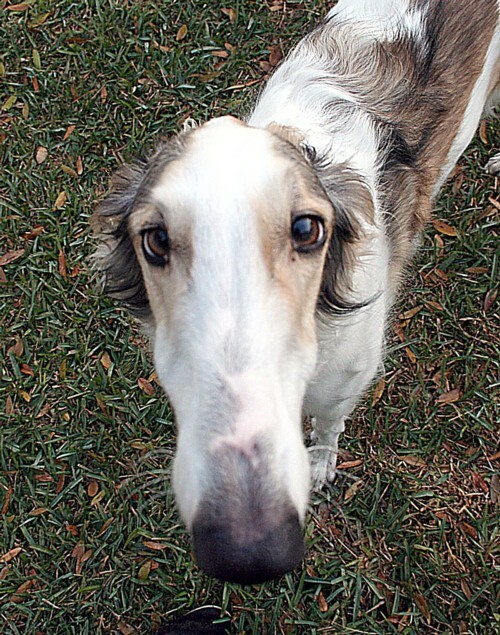 I could not believe how much he looked like our KALIF ! 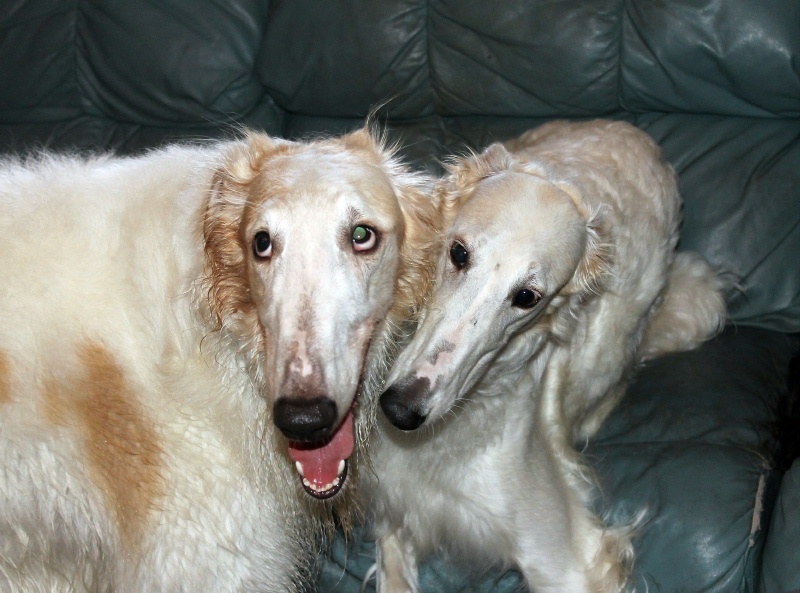 I called the breeder and said, "YES"! How soon may we come up? WELL... The next day... We 'all' met! My GOD! He is KALIF!! With Margie... Love at first SIGHT; he KNEW !! 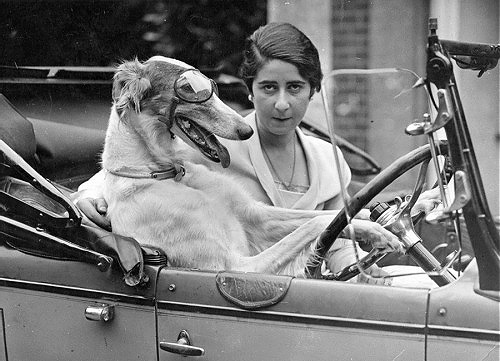 Below is a PIC of his Great, Great, Great Grandfather; he was quite the 'Lady's Man'... Kalif was a 'Chip Off the Block'!! Below: Now let the History of MAX... and VONYA begin! 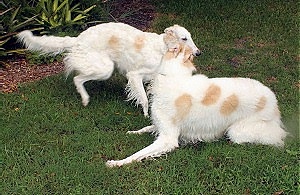 In the early/mid 1990's, we acquired our first two BORZOI (below)... JADE and STAR were both from the Kennel of Khanzade. Star meets 'cousin' Kalif... with direct family roots to Khanzade! 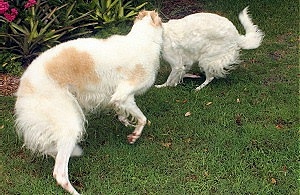 A couple of years later, Star developed Cancer; we knew he would be leaving us soon... We made arrangements for a Puppy. Enter Darla... below at 1 week old !! Her family ties went directly back to Khanzade ! 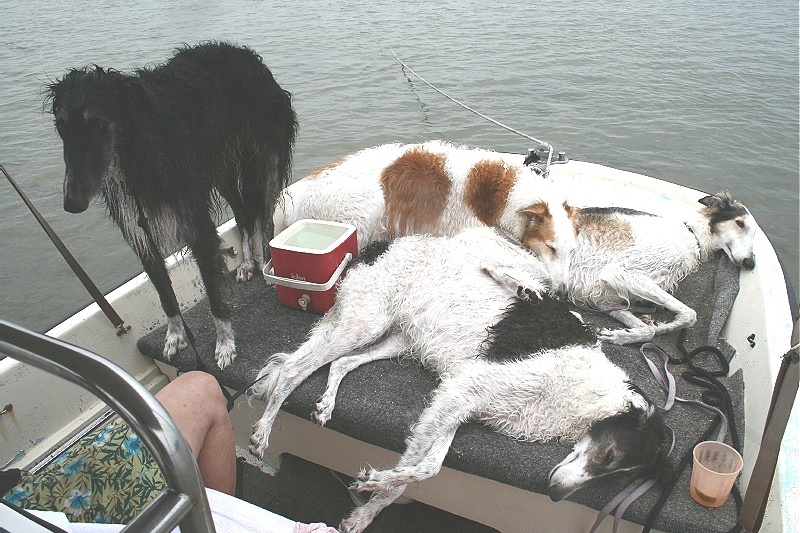 When she was 9 weeks old; Kalif, Margie, Anastasia (a year old Borzoi girl, we 'got' when Star died) and I were off to Jackson, Mississippi! 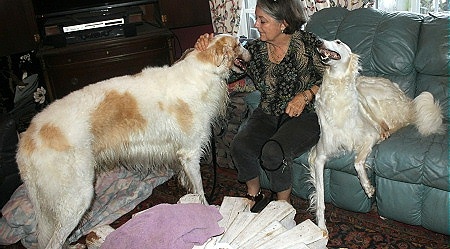 We all returned home in our Motorhome: Darla had no trouble bonding with Anastasia and Kalif !! In January, 2007, Pixie Dust joined the Clan ! 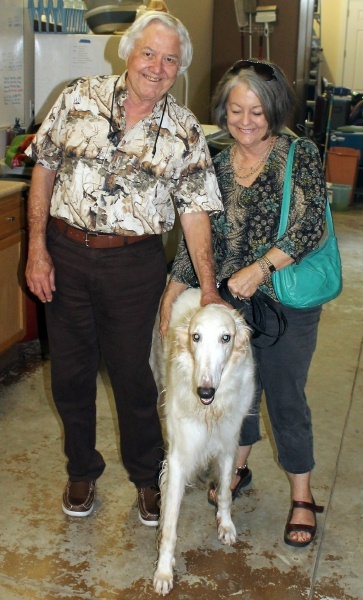 Now going Many Years ahead... to August 16, 2014: When we met MAX at the 'Poodle breeder' in Micanopy and brought him back. When VONYA met him... She went 'CRAZY'!! 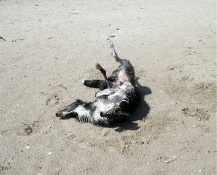 Then MAX did also!! WHY?? That night... 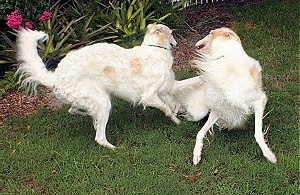 I sat down and looked at Max's Pedigree. I could not believe what I was seeing! Max's Grandmother was Khanzade's Rosemary Finn; then, looking further... I saw that his Great Grandmother was Khanzade's Ultra Modern: She was JADE'S MOTHER !! And STAR'S AUNT !! ... from the 1990's !! And no wonder, he looked like KALIF; he was a Direct Relative !! Impossible ODDS !! But Next comes something MORE than Impossible: I looked at Max's 'Birthday... February 19, 2012... I said to Margie; "That's a familiarly date??" She said, "I think that's Vonya's Birthday!" 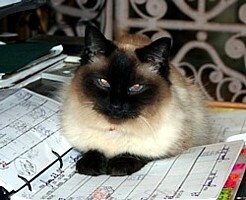 We looked at Vonya's 'papers': Birth Date - February 19, 2012... and the SAME Breeder... in Delaware! Max and Vonya are Littermates... Twins... Brother and Sister... and Vonya remembered him the second they met!! And that night... Brother and Sister reunited after Two and a Half years!! "YES... He remembers ME!!" "YES I Do... Hi SIS!!!" I LOVE YOU MAX!! And I LOVE YOU VONYA!! 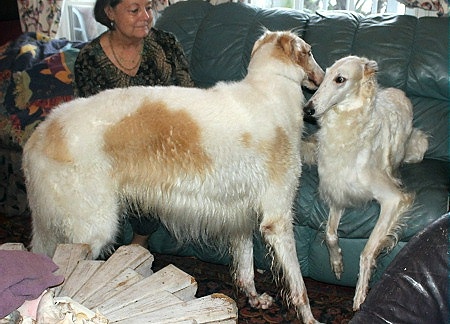 VONYA and her brother MAX have been reunited after over 2 Years!! AND KALIF was their COUSIN !! And NOW... and few days later... RINGO joins the GROUP !! 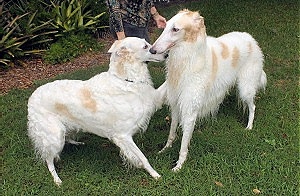 A 5 1/2 month old Borzoi PUPPY would be joining our FAMILY!! 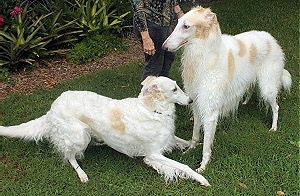 Seen below with his brother MOUSE ! I left Mount Dora on Sunday, August 24th, 2014; picked 'Ringoski' up in Cookeville, TN, 2:00 pm Monday, August 25th.. and we arrived back HOME 1:15 pm Tuesday, August 26th; after a 'quick' 1300+ mile Trip! 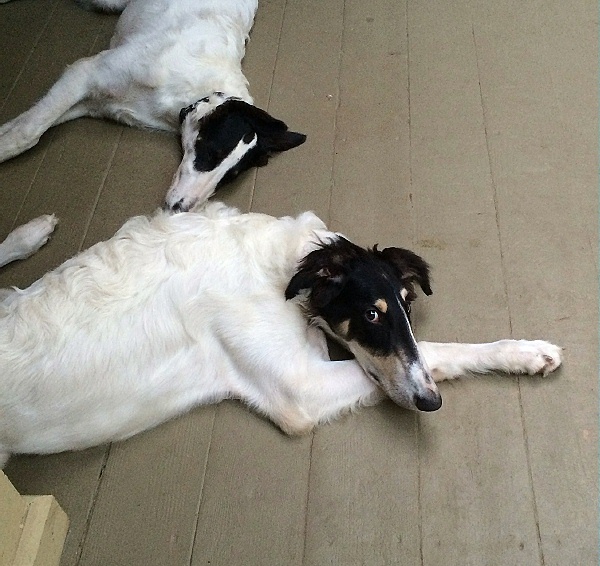 Our newest boy, Ringo, was able to meet Anastasia the day after he arrived on August 27, 2014... and spend the next 12 days with her before she died. He has been here for just over Three Years now: Three and a half years old and has perfected the 'PERFECT' Couch Potato ! And LOVING every Minute !! He sleeps in bed with us... EVERY NIGHT !! 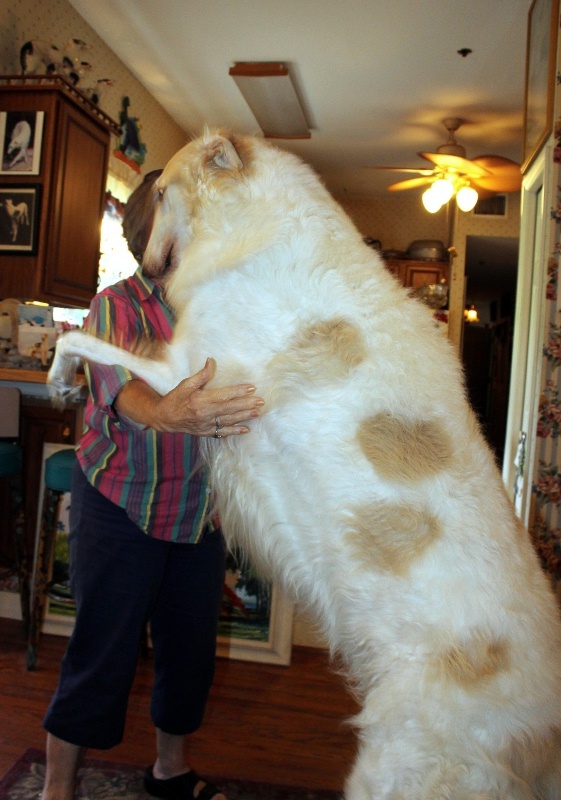 Margie and Max... 125 pounds of Fluff & LOVE (Max)! 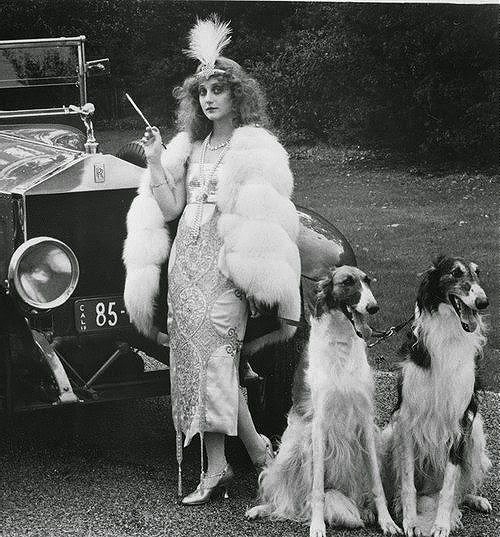 To me (72) and my Family (1920s) ... BORZOI are a Tradition! 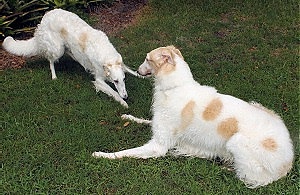 and her Borzoi... 'ROLLS' and 'ROYCE' She always made sure, 'ROLLS' was on the left! My 'Mom' was Very Cool!! Oh yes... the Fourth took the Picture... DAD ! Lu was amazing... All He wanted was to be loved and cuddled! Lay down with him... give him HUGS and LOVE... just a BIG Kitty Cat !! "The C.A.R.E. 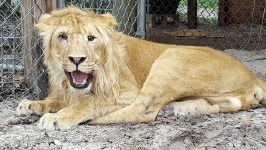 Foundation," HOME to 'LU', and many Big Cats and Exotic animals in Apopka (30 minutes from us)... 'Click' on 'LU' above, to visit 'C.A.R.E.'. "It is with a heart of deep sadness that we let you know that we said goodbye to Lucious, our beloved African lion, this past week. He passed in his sleep sometime during the night, and was laid to rest in his favorite play area, surrounded by his loving family of caretakers and volunteers. As you know, our Sweet Lu battled many health issues since birth, the most severe being neurological problems. Despite all his health issues, Lu was a fighter, and the strength and perseverance he exhibited in facing these challenges was astonishing and an inspiration to us all. He exceeded many expectations time and time again. While we were aware that his challenges might affect his lifespan, we are deeply saddened to lose him so soon, but eternally grateful for every day he was with us. Lu taught us that sometimes the broken ones are the strongest ones, and we will speak of his courage for a long time to come. So rest easy now, Sweet Lu. We thank you for the extraordinary privilege of being in your life, and for allowing us to love you as hard as we did. You are truly the bravest lion in the world. And just know that if love could have kept you here, you would have lived forever." KING OF THE JUNGLE TOUR � $100 � Approximately 2 hours... for up to 6 people. 'CAREtaker' FOR A DAY EXPERIENCE � $200 � Approximately 6 hours for up to 2 people. Join us for a day of taking care of our animals. Includes a quick tour of the facility, clean enclosures, help prepare food, and make and be part of enrichment experiences. This experience will include limited interactions with some of our larger animals like our tigers and/or monkeys. PLEASE CALL US!!! You may be able to 'book' a tour 'Last Minute'... But ONLY THROUGH US!! The NFL / a.k.a. 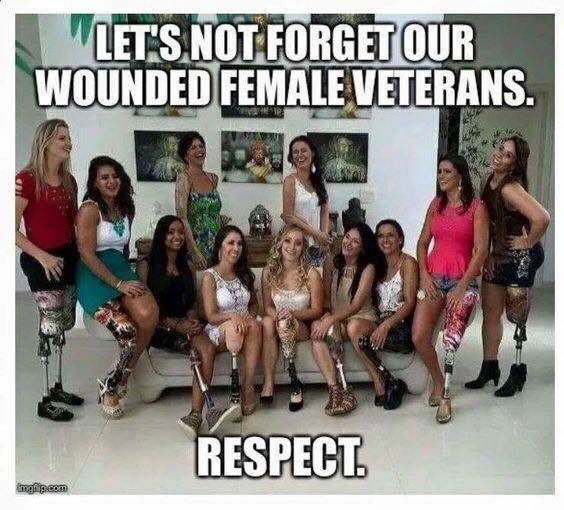 POS... LET the 'LOSERS' that take a KNEE... REALLY LOSE that KNEE !! Especially... the Bottom of the BARREL... KAEPERNICK !! Remember, these WINNERS 'GAVE a KNEE' and MORE... FOR US ! !